You could build a new religion around Gregg Renfrow’s artwork. 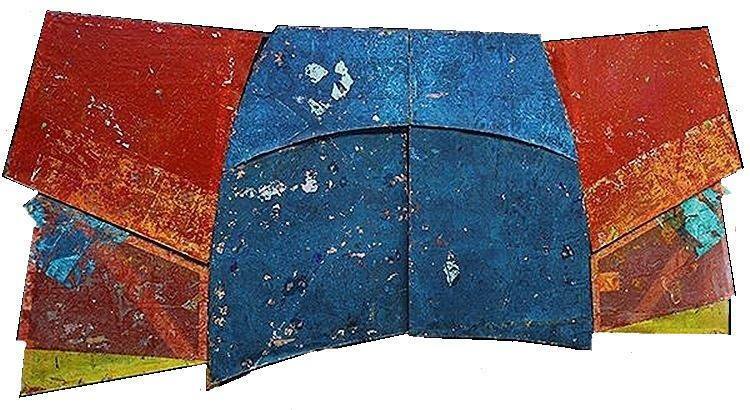 His abstract compositions—polymer and pigment poured onto cast-acrylic panels—are so luminous and elemental, they inspire a reverence normally reserved for deities. Each piece features a central motif roughly the shape of a rectangle, surrounded by shapes that echo its contours. They evoke the monolithic forms of millennia past: the standing stones of Britain, the heads of Easter Island, the totem, the obelisk, the altar, the phallus. These archetypes seize the eye and imagination and command both to pay obeisance. There’s something mystical or psychedelic about the echoing shapes as well; they radiate like tracers, expanding in a way that suggests vibration or movement. Renfrow is also a virtuoso of color. In Emanations, the central form grades through a brilliant continuum of sunflower, butter and lemon yellows before giving way to a twilight of cerulean, cobalt, ultramarine and aquamarine. In the piece that gives the show its title, Dream With Your Eyes Open, inky blacks yield to grays and vivid purples. Not all the pieces are so saturated, however. In Speaking and Memory of Water, the central shapes are the same color as the backgrounds, their forms suggested only by outlines on the panels or, in some cases, a second panel placed behind it. It’s as if the forms are in the process of evaporating or leaving their bodies. 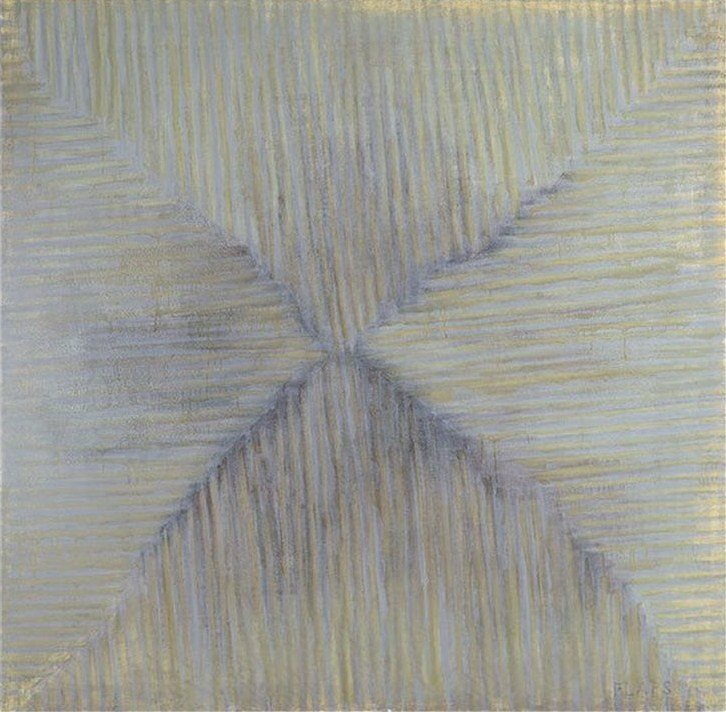 This suggestion of dematerialization links Renfrow not only with fellow exponents of the California Light and Space movement, such as James Turrell and Robert Irwin, but also to abstract expressionist Mark Rothko. Rothko’s mature style involved floating rectangular shapes that seemed to dissolve in a misty haze, much as Renfrow’s forms do. It’s notable that the Rothko Chapel in Houston uses paintings as a vehicle to dissolve the boundaries between light, color, form and spirit. Looking at Renfrow’s panels, it’s impossible not to imagine what they would look like lining a cathedral, like stained glass. But until that commission, we’re thrilled to see the artist’s work wherever we can find it. These magnificent works, in their way, turn any room into a temple. 1977 California Painting and Sculpture: The Modern Era, The Smithsonian Institute, Washington D.C.
35th Biennial Exhibition, Corcoran Gallery of Art, Washington D.C.
Catalogue: The 35th Biennial Exhibition of Contemporary Painting, The Corcoran Gallery of Art, Washington D.C.
Ratcliff, Carter, “Report From San Francisco,” Art in America, May–June, pp. Titled “Flaps and dated 1990′”. California Artist Rick Arnitz’ current tool of choice is a paint roller. He calls this instrument “a mechanical mediator between the hand and the canvas,” which is expressive, but has limitations. Arnitz labels his creations “semi-abstract art”—halfway to serious meaning. I ask the viewers to meet me there.” When presented with Arnitz’ work, the viewer is intrigued and drawn in by the apparent lack of content, then held by the transfixing textures and ubiquitous rhythms of variation. The titles challenge the viewer to connect what they observe to possible meanings. In the tradition of eye-dazzling abstraction, there is something both satisfying and slightly mysterious about Rick Amitz’s adroit manipulation of paint. In “Backdrops,” the artist’s most recent body of work, shimmying stripes or interwoven patterns of contrasting lines alternately pop forward and recede, lock in to a single plane, or jostle one another in an undefinable space. Although several canvases are essentially black-and-white, others feature brilliant, almost shocking reds, blues, or yellows. Color, however, isn’t really the key that reveals the meaning of these works. Instead, it is the means of their making. For fifteen years, Arnitz has painted almost exclusively with a roller. His choice of tools is neither a gimmick nor a strategy, but rather a means for expressing his heartfelt affection and admiration for Abstract Expressionism–while acknowledging the impossibility of such painting in the twenty-first century. Since Arnitz is the master of his method, his paintings could become as celebrated for the way they are made as for the result. ‘What prevents that from happening is Arnitz’s gift for tempering his own virtuosic mark-making with an idiosyncratic deadpan humor. Something is slightly off-kilter about these canvases, expressed through ironic titles and unusual proportions. Bylines and Obit (both 2001), each about the size and shape of a closed newspaper, are covered with random allover patterns of black and white. Yet what text, regarding author or subject, is to be read in these cryptic lines? The title of Choir Girl, 2002–a three-by-three-foot square of oscillating, blondish hatch marks–might have been inspired by Arnitz’s memories of his childhood Catholicism. In Canon, 2001, densely packed rows of black and white bars have a pleasurably claustrophobic intensity. But is the painting’s name a reference to religious music or (recalling the artist’s radicalism in the ’60s) a joke about the impenetrable work of dead white men that is supposedly at the core of our culture? If clues are to be taken from titles, the most obvious one is in Letters from the Earth, 2001-2002. Mark Twain’s book of the same name, written in the form of letters from Satan to the archangels, makes fun of most organized religions, though it reserves particular scorn for Christianity. In its own way, Arnitz’s painting resists order (and the geometry of any grand plan) by confounding the eye’s expectations. A peculiarly tall rectangle, Letters is dominated by juicy stripes of cadmium red running continuously from top to bottom. On closer examination, these scarlet lines break and stutter, slipping behind and then in front of a patchy field of pale gray. Bits of canary yellow added here and there in the bottom half of the canvas emphasize the improvisational nature of Arnitz’s technique, as do the stripes of red that lean slightly to the left as they fill the canvas. There is something enjoyable about the implication that one thing led to another, and not always in the way either artist or viewer might have expected. Arnitz once said that he likes the way a roller “repeats mistakes.” Though such a remark suggests a lack of pretension, it also embodies a kind of stubborn pride. His patient mastery of the pedestrian roller’s so-called accidents has brought his work to a level of extraordinary refinement. In the end, it doesn’t really matter what the titles refer to, if anything at all. Even in the most troubled times, there is a need for painting that is just painting, and for the pleasure and solace that beautiful things provide. 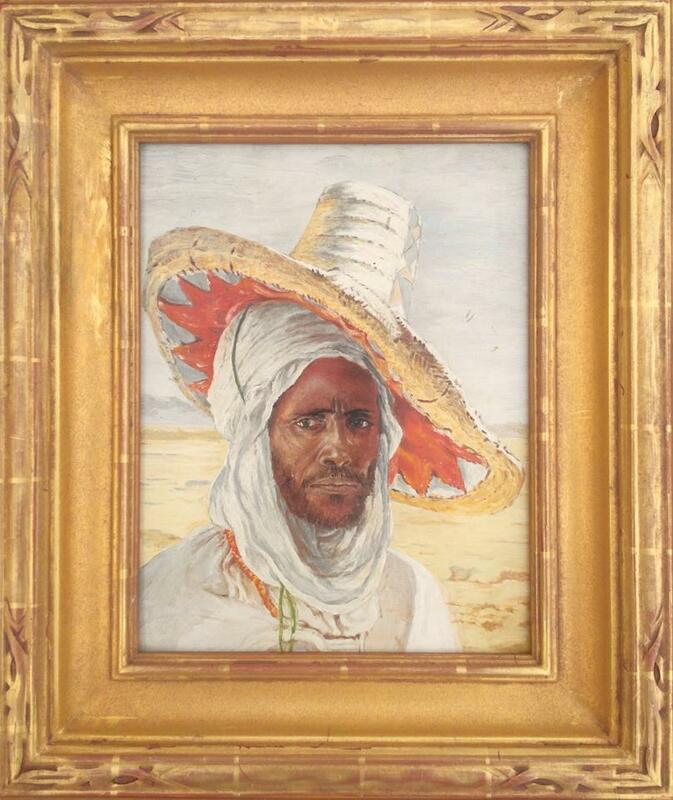 Born in Paris in 1861 to a middle class family, Alphonse Dinet became a painter and writer, who devoted much time to Algerian and Orientalist subjects. He studied at the Ecole des Beaux Arts and in 1884, earned recognition from the Palais de l’Industrie, which led to a five year scholarship to Algeria. Upon his return in 1889 to Paris, he exhibited paintings from Algeria, which earned him a Silver Medal at the Salon. In 1905, he returned to Algeria, and settled in Bou-Saada for the remainder of his life. There he traveled extensively in the desert and became familiar with the tribes and nomadic Bedouins. In 1913, he converted to Islam and took the name Nasreddine Dinet. He had a paint shop with that name, located at the edge of the Qued Bou-Saada. In 1929, he made a pilgrimage to Mecca, and on December 24th was in Paris, where he died.